Comptroller’s Office. 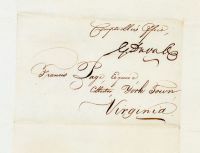 Addressed to Francis Page, Esquire. Collector, York Town, Virginia. GABRIEL DUVAL, jurist, was born in Prince George County, Md., Dec. 6, 1752; of French Huguenot ancestry. He was admitted to the bar and practiced in his native state. In 1794 he was elected a representative in the 4th congress, resigning just before the completion of his term to accept his appointment as judge of the Supreme Court of Maryland. He was a presidential elector in 1796 and 1800; was comptroller of the U. S. treasury, 1802-11, and Nov. 18, 1811, was appointed an associate justice of the United States Supreme Court. He resigned in 1836 and died in Prince George county, Md., March 6, 1844. Fine.